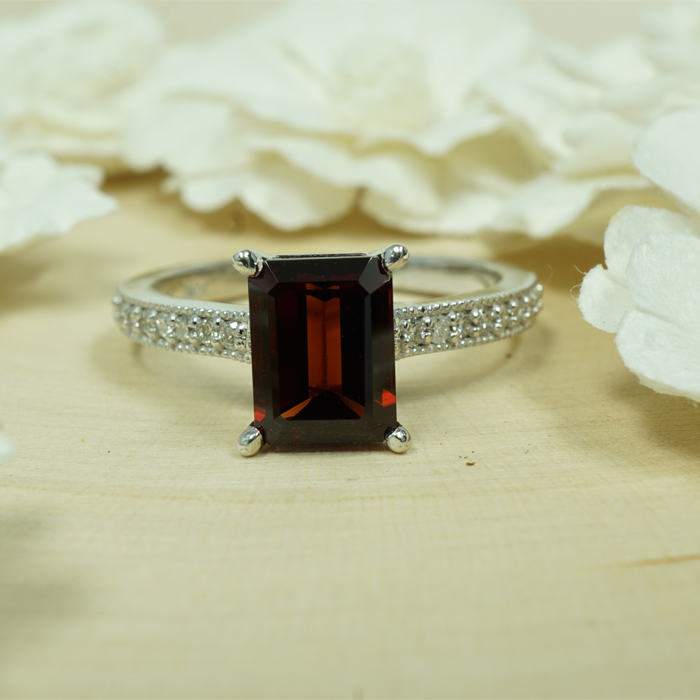 Whether you have a genuine black onyx ring or a black-stained agate ring, regular maintenance and cleaning is the same. Because black onyx ranks at a 6 – 7 on the Mohs scale of mineral hardness, it is not as strong as other gemstones – like diamond or corundum – and does require special care and upkeep to bring out its silky and lustrous shine. With proper maintenance, this gemstone is one that can last for many years. As with any type of gemstone, it is always recommended that you handle your jewelry pieces by their bands or chains, and never by the actual stones themselves. This prevents the gem from accumulating buildup of natural oils and other residue that are often transferred from the hands. Black onyx is very porous and absorbent, so it is not advised to expose your stone to any cleaning chemicals, as they may soak into the stone and cause its color to fade or change entirely. Although ammonia is commonly used to clean other types of gemstones, it should not be used for cleaning black onyx – even mild liquids like hand or dish soap are not recommended. Another cleaning method to avoid for this gem is using an ultrasonic cleaner, because the cleaning liquid and ultrasound vibrations can be damaging to the stone. Begin by buffing the ring or stone with a 100% cotton cloth before applying any polish, as this will loosen up any caked-on residue or oils. Moisten the cloth in warm water and wring out any excess water so that it is not fully wet. Wipe the stone clean using the damp cloth. Pat the stone dry using another soft, 100% cotton towel that is completely dry. Try to avoid using your fingernails to get in the crevices. If desired, apply a small drop of olive oil to the stone to produce a glossy look. Polish any metal settings in the jewelry piece using a polishing cloth. You might also want to visit a certified jeweler each year to have your gem professionally polished. Be sure to have the jeweler examine the stone’s mounting and setting, too, so you can check to see if the stones have been repositioned at all. Black onyx is only moderately durable in terms of mineral hardness, which means that proper storage is essential to maintaining its smooth, unaltered surface. If this gem is loosely stored with other harder gemstones, it will most likely become damaged. Because of this, it’s crucial to protect your jewelry as much as possible, so as to not scratch or chip any pieces. The best recommendation is to store each of your gemstones separately in compartmentalized boxes at room temperature. If your black onyx stone should become cracked or damaged, it is advised that you take your stone to a professional for repairing. Because most black onyx is in fact treated, a professional jeweler will have the most knowledge in repairing the stone and if a repair is worth the money.